When it comes to wheelchair vans, no two are ever exactly the same. That is because each and every wheelchair van is custom built from the ground up. 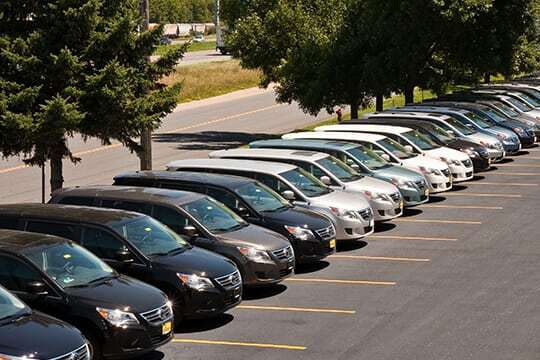 And while two vans could be the same make, model, color and have the same standard option package, their adaptive driving equipment options is what sets them apart and makes them totally unique. 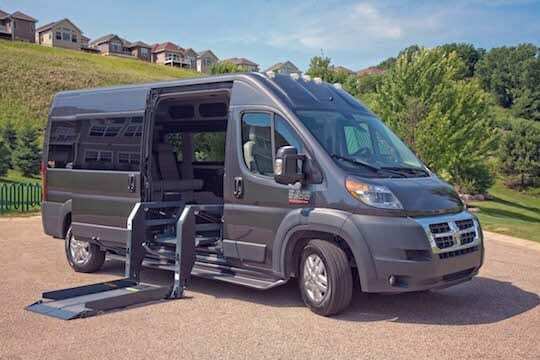 If you are researching wheelchair van conversion types, it is likely that you have already read a few things about the adaptive driving equipment options available. But, it is important to take a deeper dive into your options and learn as much as you can about the items available. So, what adaptive driving equipment options exist in our market today? Let’s take a look. There are many different types of ramps and lifts available on the market for van conversion. 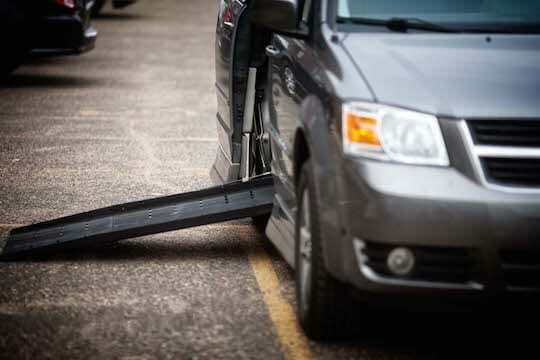 For minivans the floor is lowered 10-15 inches and a ramp is used to enter and exit the vehicle. There are two main types of ramps for minivans: in-floor ramps and fold-out ramps. In-floor ramps are the more popular style as they do not block access to the door while the ramp is not in use and they are operated with the simple click of a button on a remote. This style of ramp also allows for the door height to accommodate 55 inches of space. Fold-out ramps are just as safe and reliable as an in-floor ramp, but folds up directly behind the sliding door of the van when not in use. Fold-out ramps also have a cost savings advantage as they as less costly to install and require less maintenance. 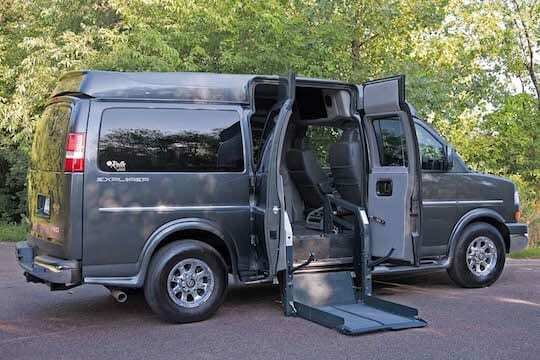 Wheelchair lifts are installed on full-size van models like the GMC Savana, Chevy Express, Dodge Ram Promaster and Ford Transit. Most full-size vehicles get either a lowered floor or raised roof. These van models require a lift instead of a ramp because the vehicle’s door is much higher off the ground. Lifts come in two models: single arm and dual arm. Dual arm lifts are more popular as they can accommodate heavier loads and can lift up to 800 pound wheelchairs. 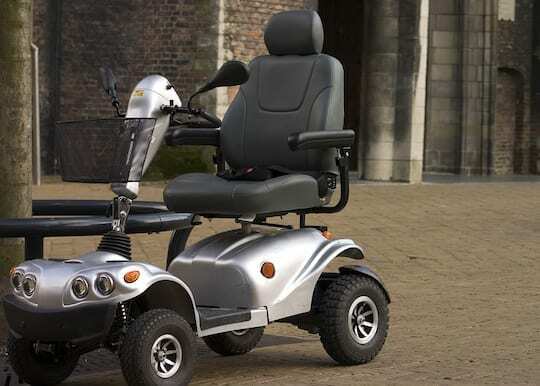 One adaptive driving equipment option that is popular amongst our customers are transfer seats. Transfer seats allow wheelchair users a quick and safe way to move from their wheelchair into the driver’s or passenger’s seat. Some transfer seats on the market swivel outside of the van and require wheelchair users to have assistance loading their wheelchair into the vehicle after they have transferred. The Rollx Vans six way trackless design allows wheelchair users to transfer from within the vehicle into either the driver or passenger seat. One accessibility feature that allows wheelchair users the freedom to go where they want to go is hand controls. Hand controls rest just underneath the steering column and are adjustable to fit every driver. 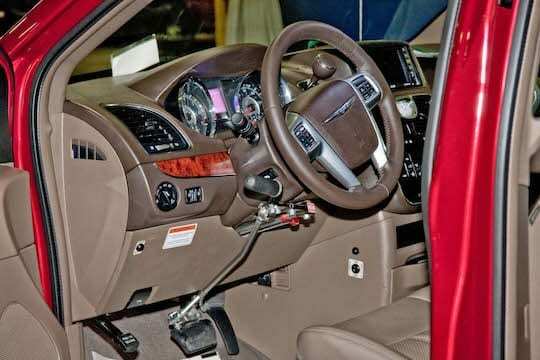 They come in mechanical, pneumatic and electronic setups and won’t interfere with the driving pedals, so the van can still be driven by an individual wishing to use the standard pedals. Wheelchairs can not be secured in a vehicle with standard seat belts. Instead, wheelchairs are safely locked into place with tie downs and securements. There are multiple options available for tie downs including manual, retractable and power versions. Manual tie downs are a simple form of securement. They hook to the floor of the vehicle and secure wheelchairs in four locations. This version of tie down can only be used in the passenger and center areas of the van. Retractable tie downs are very similar to manual tie downs in that they secure power and manual wheelchairs to the floor of a vehicle in four locations. The difference is that the tie down straps retract to eliminate exposed straps that could become tangled. 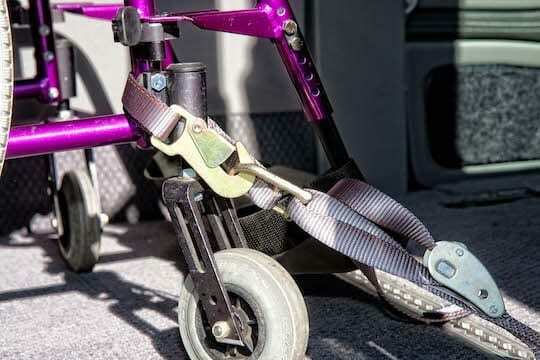 Power tie downs are the most convenient form of securement for wheelchairs in a vehicle. The locking mechanism is secured to the floor and connects to a rod that is installed on the bottom of a wheelchair. The release of a wheelchair from the power securement, requires a simple click of a button. Power tie downs can be used anywhere in a vehicle, including the driver’s seat area. 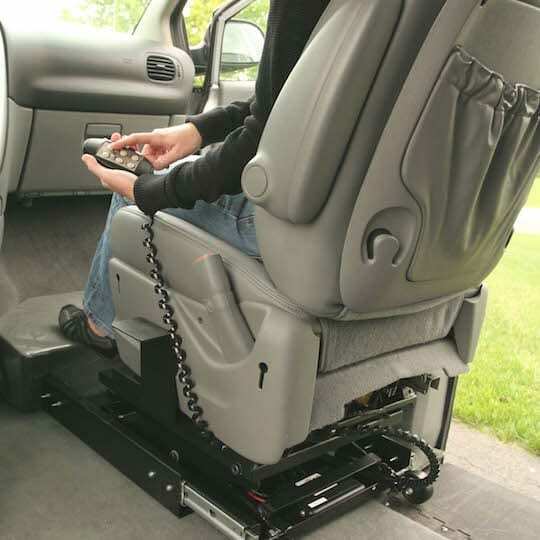 While seating configuration is not exactly an equipment option, it is an important factor to consider while determining the equipment options you need for your wheelchair van. That is because various equipment choices can affect seating configuration. For example, a rear entry ramp eliminates the backseat of a van and reduces the number of people that can ride in the vehicle. In addition to equipment options and seating configuration, on occasion, manufacturers need to accommodate additional height for a wheelchair or its user. They do this by lowering the floor of the van or adding height to the roof (often referred to as an eyebrow). Luckily, they can do this because wheelchair vans manufacturers customize your wheelchair van from the ground up. This allows every feature that a wheelchair user needs to be included. Want to learn even more about your adaptive driving equipment options?